I remember a day in third grade when the school nurse lined us up and methodically combed through our hair with a thin stick looking for head lice. It felt awesome and finally gave me an insight as to why cats get so zonked out when you scratch their heads. I also remember the day that she combed through my hair and found a louse. That felt less awesome and finally gave me an insight as to what it feels like to be a Dickensian orphan. 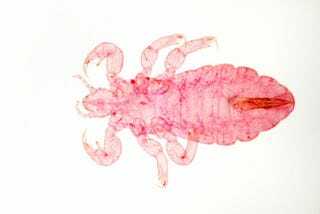 Head lice has plagued humanity for as long as people have had heads of hair for lice to nest in, and cures have been slow coming. Permethrin, the most common treatment, only works approximately 50% of the time and other treatments have been known to cause seizures. As of now, the National Health Institute recommends treating lice by picking it out with a fine-toothed comb as if we were a bunch of common monkeys.